Does your little one love pouring water in the bath (and, let's face it, wherever else he can)? Munchkin's Caterpillar Spillers™ will keep curious minds occupied for hours on end as they stack, scoop, strain, spill, pour, rinse, and repeat during bathtime. 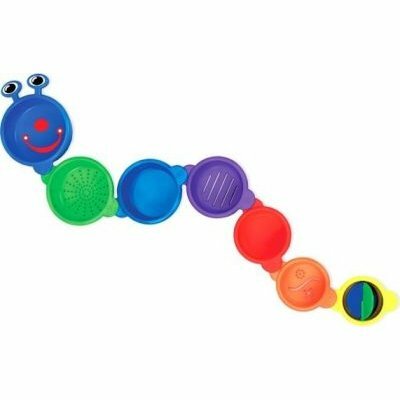 Your child will love connecting the numbered cups to create a cute caterpillar friend, or stacking them up to form a towering paddle wheel. Numbers help your child learn to count while large-to-small nesting helps build hand-eye coordination and teach sizes, too. For Age: 9 Months and older.